The premiere episode of The Fourth Wall, “Clipped Wings,” will run on Wednesday, September 27th. Therefore, over the next several weeks here on the blog we’ll run brief introductions to the characters for the show. Last week we discussed the series’ lead, Abigail Westing. Read all about her here. This week, let’s catch up with John H. Watson, MD. At the tender age of 165 years, he suspects that he might have lived a bit too long. At this point, he wonders if he even can die. Many years have passed since he last cracked a case with Sherlock Holmes, but he is busier than ever. Guilt from a lifetime of mistakes dominates Watson’s thoughts. His only comfort is knowing that Merlin made far more errors in his day. He is possessed of one purpose: either destroy, or bring to justice the creature who once lived as Vlad the Impaler, and now travels as the vampire, Count Dracula. One element is crucial to the completion of what might be his final case, and that is to ensure that Abigail Westing—a person from the Real World—joins the ranks of The Fourth Wall. A real person has never been allowed access to The Wall, but Watson is insistent on keeping his reasons for the exception to himself. Watson is cranky and irascible, yet grandfatherly and protective. The people of The Fourth Wall trust him with their lives, and he does not take that trust lightly. And yet, he still dreams of the days where he chased murderers into the night with a volatile genius, and the love he had to leave behind in his story. 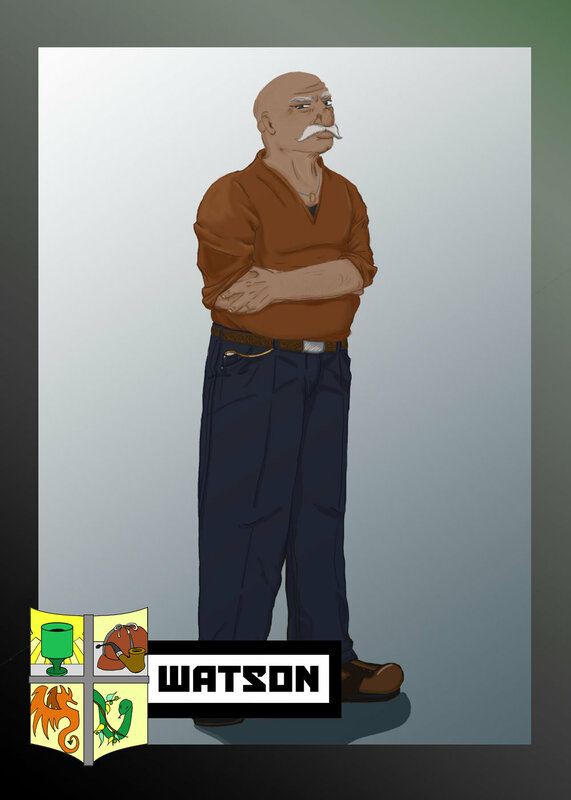 Watson is voiced by Bill Fisher. As I’m writing this, I am editing a key scene in Episode 2. Move over Nigel Bruce, Jude Law, and Martin Freeman. Bill Fisher is John Watson. I keep feeding him pages of exposition, but he keeps knocking it out of the park. By any reasonable measure, he has been with Party Now Apocalypse Later Industries longer than anyone else. Way back in the day, he played Really Good Man in our first film. For some reason, he keeps coming back when I’ve got a new project in the hopper. He’s my oldest friend, and I find it nearly unfathomable to not have him involved in a project. In addition to playing the role, Fisher did the artwork on the covers for The Devil Lives in Beverly Hills and Orson Welles of Mars. He also designed the logo for The Fourth Wall, and did the art for one of the forthcoming trading cards (more on that next week). That “poem” is a one-note caricature of the many-layered splendor that is me, okay? Uh, sure. Can we talk about that next week? Squawk! HE’s not here, is he? Can’t remember the last time I was interrupted in the middle of a blog... Anyway: until then, friends. In the mean time, find where to subscribe to The Fourth Wall podcast here.